This entry was posted on Monday, September 12th, 2011 at 21:49 and is filed under Election 2012, GOP Candidates, Politics, Sarah Palin. In an appearance on FNC’s On the Record with Greta Van Susteren, Gov. Sarah Palin was asked by Van Susteren about Bachmann’s question in Monday night’s Tea Party Express-sponsored Republican debate about the issue of his Gardasil mandate, but more importantly, the ties to Merck, the company who would have provided the untested vaccine to the market. Palin, who has encouraged a spirited debate all along between opposing candidates in the Republican field seemed happy to agree with Bachmann in this instance. Despite Perry’s admission that his actions on the Gardasil vaccine may have been a mistake when he entered the campaign in early August, he’s never really faced any direct questioning over the crony-capitalism aspects of that issue. As this blog has reported, Governor Perry has extensive issues with crony capitalism as best illustrated by the Gardasil controversy as well as others, including the now-dead TransTexas Corridor. Governor Palin certainly seemed to relish the notion of taking on the issue, and in truth, it’s an issue ripe for full examination. Most of the Republicans in Monday night’s debate suffer from one or more instances of this sort of problem, and as I reported earlier Monday evening, President Obama is potentially involved in a gigantic scandal arising from this sort of corruption. Palin once again refrained from discussing her plans for the upcoming election, but this interview suggests that she’s already involved in the 2012 race, no matter the role. It’s certainly getting interesting! It would appear Gov. 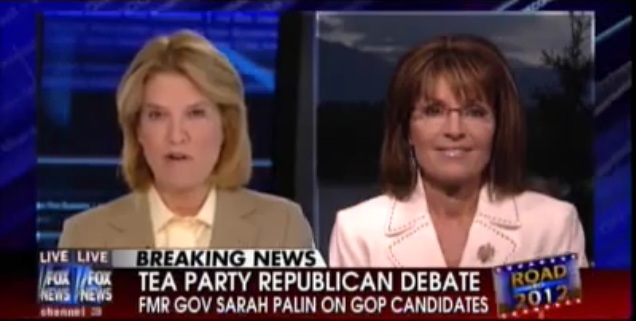 Palin is shifting the debate on her terms without even announcing. Her interview has eclipsed the CNN debate all together. I'm also learning that Romney has a few issues with crony capitalism too. For example, RomneyCare allowing the SEIU to determine waivers to RomneyCare in MASS. That was very interesting indeed. All those who said "Sarah is going to announce her endorsement of Perry this month" appear to be all wet, after that 12 minutes. But Perry is still my third choice after the two ladies. There is no fourth choice. Thanks. Unfortunately, my Dane developed a terminal case of the "old" earlier this year. I still miss my best friend, although my German Shepherd is doing her best to fill the void.